Know any teens who want to help save the earth? 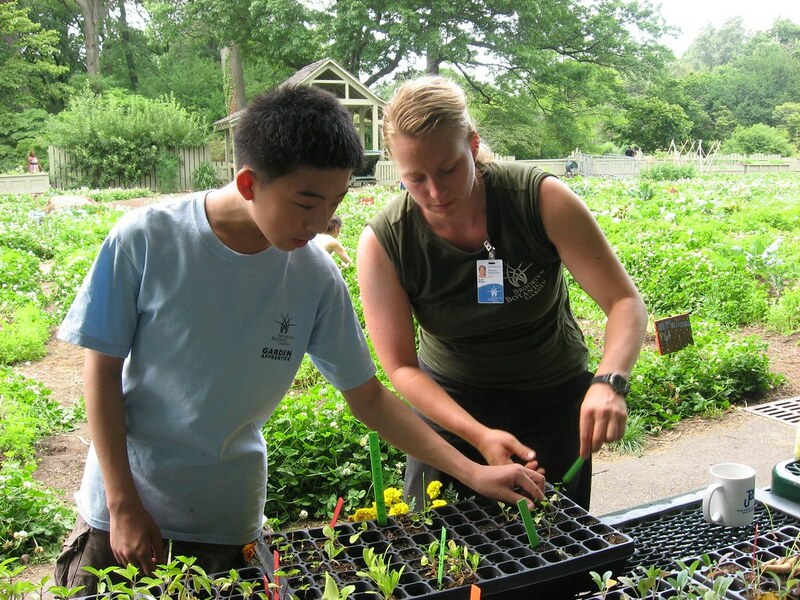 The BBG’s Garden Apprentice Program (GAP) could be the perfect way to start them off. GAP teens learn about urban farming, science, and the environment while working in one of the most exciting public gardens in the world. They grow, harvest, and cook their own crops, work with kids in the Children’s Garden, assist horticulturists and scientists behind the scenes, and explore the Garden’s plant collections in depth, all while developing teamwork and communication skills that will prepare them for future careers. Applications are now being accepted for apprenticeships, which run from March to November 2012. The program includes spring training, summer programming, and a weekly commitment throughout the academic year. To learn more, attend the GAP open house on Saturday, November 12 (reserve your spot by emailing [email protected]). More information is also available online at bbg.org/gap. GAP Discovery Guide Nicholas selects seedlings to transplant into his plot, with the help of Instructor Hilary. Photo by Saara Nafici.